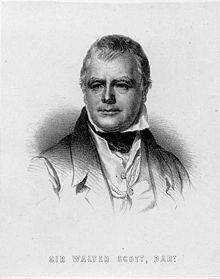 Sir Walter Scott, 1st Baronest (15t August 1771 - 21st September 1832) wis a kenspeckle Scots historical novellist an makar that wis gey popular oothrou Europe in his time. In some weys, Scott wis the first Inglis language writer tae hae a truly internaitional career in his lifetime, wi mony contemporar readers aw ower Europe, Australie an North Americae. His novelles an musardry is still read the day, an mony o his warks bides clessics o baith Inglis-leid leeteratur an Scots leeteratur. Weel kent warks o his includes Ivanhoe, Rob Roy, Marmion, Waverley an The Heart of Midlothian. Scott's bairnheid at Saundyknowes, close tae Smailholm Touer, introduced him tae dytes o the Scots Mairches. Born in Colledge Wynd in the Auld Toun o Edinburgh in 1771, the son o a soleeciter, the young Walter Scott won throu a bairnheid bout o polio in 1773 that left him a lamiter aw his days. Tae hulp wi his lameness, he wis sent thon year tae bide in the landwart Mairches at his grandpaurents' ferm at Saundyknowe, no faur frae the rauchle o Smailholm Touer, the umwhile faimily hame. Here he wis leared tae read by his aunt Jenny, an learned frae the dialect on mony o the dytes an legends that chairacterized mony o his best kent warks. In Januar 1775 he retoured tae Edinburgh, an thon simmer gaed wi his aunt Jenny tae tak spa treatment at Bath in Ingland. In the winter o 1776 he gaed back tae Saundyknow, wi crack at a watter cure bein made at Prestonpans the follaein simmer. In 1778 Scott retoured tae Edinburgh for private eddication tae mak him ready for the schuil, an in October 1779 he stairtit at the Ryal Hie Schuil o Edinburgh. He wis weel able tae walk the nou, an splore the ceety as weel as the landwart pairts aboot it. His readin includit chivalric romances, musradry, history an vaigin beuks. He wis gien private tuition by James Mitchell in arithmatic an writin, an learned frae him the history o the Kirk wi emphasis on the Covenanters. Efter feenishin schuil he wis sent tae bide for sax month wi his aunt Jenny in Kelsae, gaein tae the local ott begoud studyin clessics at the Varsity o Edinburgh in November 1783, whan he wis juist twal year auld, sae he wis a year or twa younger nor maist o the ithir scholars. In Mairch 1786 he begoud a prenticeship at his faither's office, for tae become Writer tae the Signet. While at the varsity Scott becam a freend o Aidam Ferguson, the son o Professor Aidam Ferguson, that hostit leeterar salons. Scott met wi the blind makar Thomas Blacklock that lent him beuks as weel as introducin him tae James Macpherson's Ossian cycle o poems. Durin the winter o 1786-87 the fifteen year auld Scott saw Robert Burns in ane o thir salons, for whit wis tae be their ae meetin. Whan Burns noticed a prent illustratin the poem The Justice of the Peace an speired wha haed written the poem, anely Scott coud tell him it wis by John Langhorne, an wis thankit by Burns. Whan it wis decidit that he wad become a lawer he retoured tae the varsity tae study law, first takkin clesses in Moral Philosophy an Universal History in 1789-90. Efter feenishin his studies in law, he becam a lawer in Edinburgh. As a lawer's clerk he made his first veesit tae the Hielands, directin an eveection. He wis admeetit tae the Faculty o Advocates in 1792. At the eild o twinty-five he begoud tryin his haund at scrievin, pittin warks ower frae German, his first publication bein rhymed versions o ballants by Bürger in 1796. Syne he set furth a three-vollum set o Scots ballants that he'd ingaithert, The Minstrelsy of the the Scottish Border. This wis the first shaw o his intrest in Scots history frae a leeterar staundpynt. Scott syne becam a gleg volunteer in the yeomanry an on ane o his "raids" he met wi Margater Charlotte Charpentier (or Charpenter), dochter o Jean Charpentier o Lyon in Fraunce, that he wis mairiet on in 1797. They haed five bairns thegithir. In 1799 he wis appyntit Shirra-Depute o the Coonty o Selkirk, based in the Ryal Burgh o Selkirk. In his earlier mairiet days, Scott haed a dacent leevin frae the siller he teuk at law, his salary as Shirra-Depute, his guidwife's income, a wee bit siller frae his scrievin an his skare o his faither's wee estate. Efter Scott haed foondit a prentin press, his musardry, stairtin wi The Lay of the Last Mistrel in 1805 brocht him fame. He set furth a nummer o ithir poems ower the neist ten year, includin the popular The Lady of the Lake, prentit in 1810 an setten in the Trossachs. Walins o the German trsnslates o this wark wis syne pitten tae muisic by Franz Schubert. Ane o thir sangs, Ellens dritter Gesang is aften kent as "Schubert's Ave Maria." In 1809 his seempathies led tae tae become co-foonder o the Quarterly Review, a review jurnal that he made twa-three anonymous contreebutions tae. Whan the press becam fankelt wi siller fykes, Scott set oot, in 1814, tae scrieve a cash-cou. The affcome wis Waverley, a novel that didna lat on wha haed written it. It wis a dyte o the Fowerty-Five wi its Inglis heid chairacter Edward Waverley (seempatheric tae Jacobitism efter his Tory upbringin) getting fankelt in happenins but in the hintend walin Hanoverian respectibeelity. The novelle wis a muckle success. Efter thon there follaed a rin o novelles ower the neist five year, ilkane wi a Scots historical settin. Keepin in mynd his namlyheid as a poet, he haudit tae the anonymous habit he haed stairtit wi Waverley, aye settin the novelles furth unner the name Author of Waverley or attributit as "Tales of...£ wi nae author. E'en whan it becam clear that there wad be nae skaith in comin oot intae the open he keepit up the façade, appearinly oot o a sense o fun, awmaist as a pliskie. Durin this time the byname The Wizard of the North wis applee'd by fowk tae the meesterious best-sellin writer. The identity o the author o the novelles wis a faur reengin souch, an in 1815 Scott wis gien the honour o takkin meat wi George, Prince Regent, that wis wantin tae meet wi "the author of Waverley." Thir novelles wis mainly in Inglis, but whiles Scots wis uised as pairt o dialogue atween chairacters - specially anes that's frae landwart pairts or o laich social staundin. In 1819 he brak awa frae scrievin anent Scotland wi Ivanhoe, a historical romance setten in 12t-century Ingland. Thon, as weel, wis a rinawa success an, as he did wi his first novelle, he wrate twa-three beuks alang the same lines. Amang ither things, the beuk is kenspeckle for haein a gey seempathetic Jewish heid chairacter, Rebecca, thocht o by mony creetics tae be the beuks reale heroine - relevant tae the fact the beuk cam oot at a time whan the strauchle for the Unthirldom o the Jews in Ingland wis gaitherin momentum. As he becam mair weel kent durin this pairt o his career, he wis grantit the teetle o baronet, becomin Sir Walter Scott. At this time he redd the veest o King George IV tae Scotland, an whan the King veesitit Edinburgh in 1822 the muckle shaw he pit on wis intrumental in makkin sicna things as tairtans an kilts fashionable, an turnin thaim intae seembols o Scots identity. Stairtin in 1825 he fawed intae richt haird siller fykes again, as his company awmaist fauldit. That he wis the author o his novels becam ordinar knawledge at this time as weel. Raither nor declare bankruptcy, he pit his hame, Abbotsford Hoose, an income intae a trust belangin his creeditors, an gaed on tae scrieve his gate oot o det. He cairiet on his feel quick ootpit o feection (as weel as settin furth a biography o Napoleon Bonaparte) till 1831. By than his heal wis dwinin, an he dee'd at Abbotsfuird in 1832. Tho no in the clear by than, his novelles aye selt weel, an he made guid his dets frae ayont the graff. He wis yirdit in Dryburgh Abbey whaur no faur aff, fittinly, a muckle statue can be fund o William Wallace - ane o Scotland's maist romanticised historical feegurs. In 1844 the Scott Moniment wis finished. It staunds in Princes Street Gairdens, Edinburgh, an at 200.5 fit lang is the mucklest moniment tae a scriever in Europe. Forby thon, he is mindit wi a slab in Makars Court, Edinburgh, juist ootby the Scotts Writers Museum in Leddy Stairs Close, whaur is ane o the three scrievers the museum focuses on (alang wi Robert Burns an Robert Louis Stevenson). Wikimedia Commons haes media relatit tae Walter Scott. This page wis last eeditit on 13 Mey 2018, at 00:36.